Elland suffered a second home defeat to Normanton in three weeks when beaten 10-4 by the Knights in yesterday’s Conference Challenge Trophy tie at Greetland. Normanton had won the earlier Division One meeting by 34-24. Elland started strongly, sustained pressure keeping the Knights pinned in their own territory. After half an hour Oliver Fairbank turned this effort into points, though Elland were unable to add the goal. The cold and damp conditions led to lots of slipping, sliding and dropping the ball. The frustration spilled over into one or two skirmishes. Knights stepped up their efforts in the second half and Elland struggled to get into the visitors’ 22. Although Elland defended determinedly, they could not prevent Knights scoring through Thomas Alexander and Steven Lewis, plus one goal. Elland’s man of the match was forward Andy Shickell. 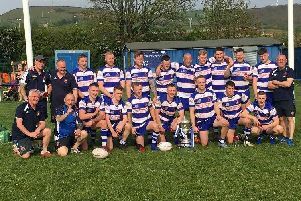 Calderdale’s other Conference side Siddal were without a game.